Click here for a printable version to share! What is the Sudbury to Hudson Transmission Reliability Project? Eversource is proposing to construct a new 115-kilovolt (kV) transmission line between Sudbury and Hudson. The new line would run between the Eversource substation in Sudbury, near Buddy Dog on Route 20 and the Hudson Light and Power substation. In April, 2017, Eversource submitted 3 options to the Energy Facilities Siting Board, referred to as "Project," "Noticed Variation," and "Noticed Alternative." Both these options are geographically the same in Sudbury. The only change is whether the lines go underground or overhead. The MBTA right of way runs through historic districts, Sudbury neighborhoods and conservation land in Sudbury, Marlborough, Stow, and Hudson. The under street option goes from the substation, along Route 20 to Green Hill Road, Old Lancaster Road to Hudson Road and into Hudson. See below for maps of both routes. What does the underground option (“Project”) involve? - 115kV under access road / future recreational trail (2' off to the side). Is that safe? - Eversource has not earned the benefit of the doubt - once they are in our neighborhoods and wildlife corridors, they are in for good. You only have to turn to what they are doing in South Sudbury, with no notice to the town or residents, where they are upgrading the line. It’s not just that the underground is or isn’t more damaging environmentally than overhead (trenching, disruption of waterways), it’s that anything on the right of way puts a utility in a protected conservation corridor - a utility with a history ignoring residents’ concerns and skirting local bylaws. There is no need; and if it’s proven there is a need, it needs to go someplace else. What does the overhead options “Noticed Variation” involve? The above ground portion will be built on monopoles 75’ to 105’ tall. 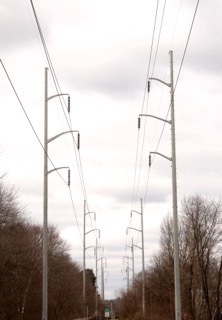 Eversource plans to clear-cut an 82 foot wide swath along the rail bed to accommodate the poles, their anchors, and the range of swing in the wires in windy situations. Trees and everything else in the path will be cleared. (Note: 82 feet wide is the length of a blue whale, or as wide as the Massachusetts Turnpike.) The poles will be anchored in concrete into the ground. The clear-cut affords room for the height of the poles and the accompanying swing of the wires in windy weather. The clear cut would look something like this, an Eversource right of way in Milford, MA. Part of the ongoing maintenance of the 82 foot wide clear-cut means regular mowing, trimming and applications of herbicides in order to control (kill) the vegetation below and around the poles, so Eversource technicians can maintain and repair the line. These chemical applications are known to be harmful to humans, wildlife, and of course vegetation. What does the under street option “Noticed Alternative” involve? The under street option has no long term impacts. It will involve traffic disruption during construction. The trenching is still required, but it will be done under existing road. 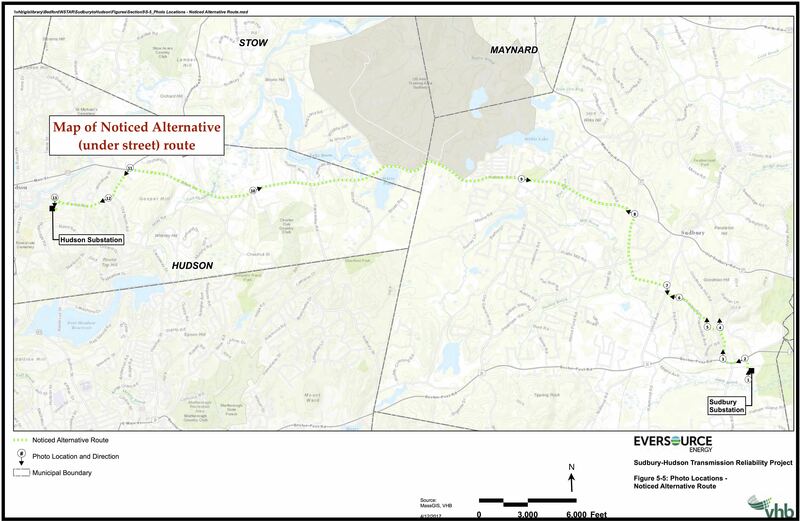 Protect Sudbury has been trying to convince Eversource to consider routing as much of the project under Route 20 as possible as it’s already a utility corridor. Eversource instead chose a route that starts on Route 20 but then onto Green Hill Road, Old Lancaster Road, and Hudson Road. There are currently two 115Kv lines already under Sudbury roads. They run from the Sudbury sub-station south of Route 20, along Goodman's Hill Road to Concord Road through the Town Center, down Morse Road. Mossman Road, across Rte. 117, and down Powder Mill Road to the Maynard sub-station on Old Sudbury Rd. Most residents don’t even know they are there. Streets will heal. What impact will Eversource’s proposal have on the town? 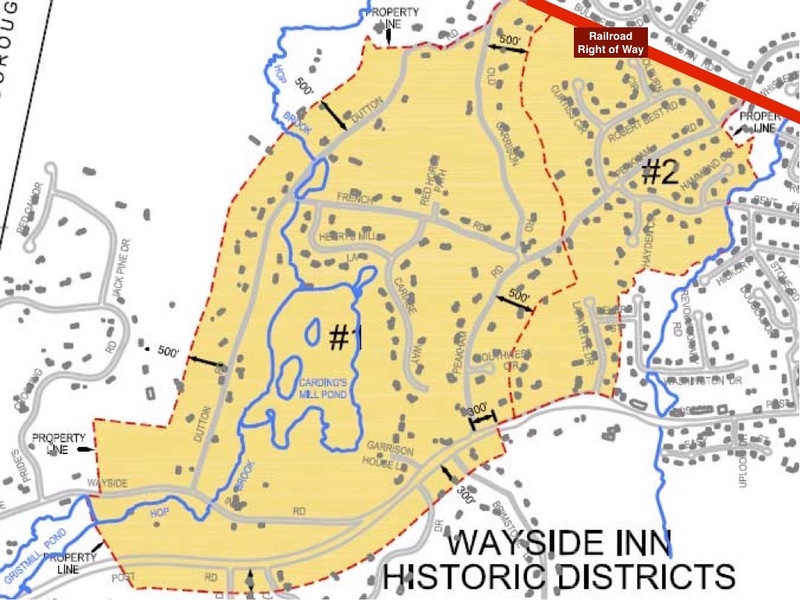 -Cut through or along side three historic districts of the town including the King Philip Historic District, Wayside Inn Historic District, and the George Pitts Tavern Historic District. -Cut through the heart of an important and unfragmented forest in Massachusetts, and a local beloved recreation area. If the EFSB chooses the under streets option, there will be some traffic disruption during construction. And then the line will be buried under the street and we will forget it’s there, like the line under Goodman’s Hill Road. What business areas and neighborhoods will the project impact? The transmission lines would run from the Eversource substation south of Route 20 behind Buddy Dog, along the railroad right of way behind Mill Village and along Maple Ave, crossing Route 20 to Station Road at Lotus Blossom and down Station Road to cross Union Ave. It then continues on the railroad right of way past the back of Cavicchio’s Greenhouses through the back of Chiswick Park, behind Trailside Circle, Bridle Path, across Horsepond Road, parallel to Jarman and Stonebrook Roads, across Peakham Road, parallel to Robert Best, Austin, and Bulkley, and Amanda Roads, and across Dutton Road just north of Old Garrison Road and into the conservation land. If it’s under streets, it will run from the substation, along Route 20, turning onto Green Hill, to Old Lancaster Road, to Hudson Road. Protect Sudbury maintains that if Eversource has to build the lines anywhere in Sudbury, it should be under Route 20, an existing utility corridor. What conservation areas does it run through? Hop Brook Marsh Conservation Land, Assabet River National Wildlife Refuge, Sudbury Valley Trustees Memorial Forest, and Marlborough State Forest. These lands are all one parcel, as described by Sudbury Valley Trustees: "Straddling the border of Sudbury and Marlborough, lies 615 acres of public and private open space dedicated primarily to conservation. This includes the General Federation’s Memorial Forest and Wildlife Sanctuary, two tracts of Marlborough State Forest, and conservation lands owned by Town of Sudbury and City of Marlborough. Its wetlands and clear streams, mosaic of oak and pine forests, and undulating terrain combine to provide habitat for a rich diversity of wildlife. Our Memorial Forest Nature Sightings page highlights some of this wildlife, featuring some great photos and videos. The extensive and varied trail system of old woods roads makes it accessible to walkers and nature watchers with little impact to the resources. As development continues to urbanize the remaining open space in Sudbury and Marlborough and neighboring towns of Hudson and Stow, this natural area only increases in local and regional significance." 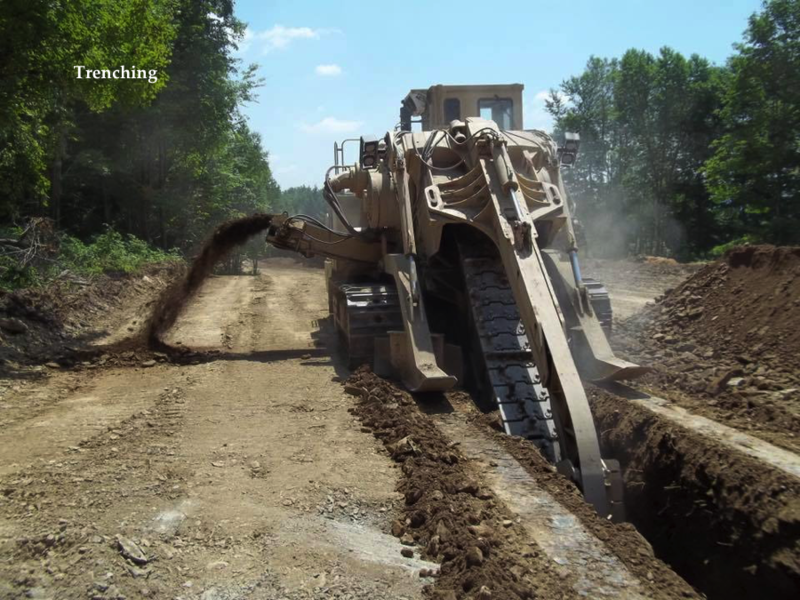 Eversource plans to create a gravel access road for their utility trucks to run in conservation areas, which compounds the damage this project will do in conservation lands. 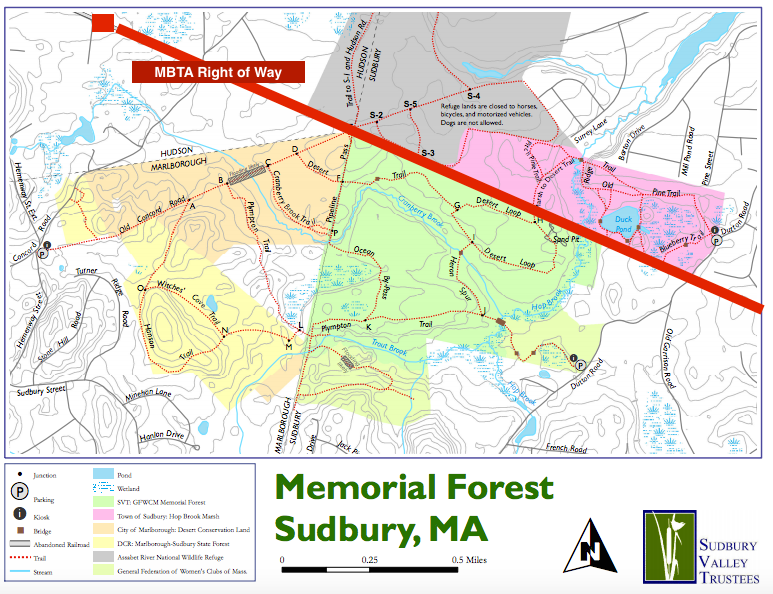 Sudbury Valley Trustees currently places limitations on bicycles and ATVs in Memorial Forest; horses, bicycles, dogs and motorized vehicles are not allowed in Assabet River National Wildlife Refuge. With this plan Eversource will have right to drive their trucks through our conservation land and neighborhoods to maintain the power lines. What Historic Districts does it run through? 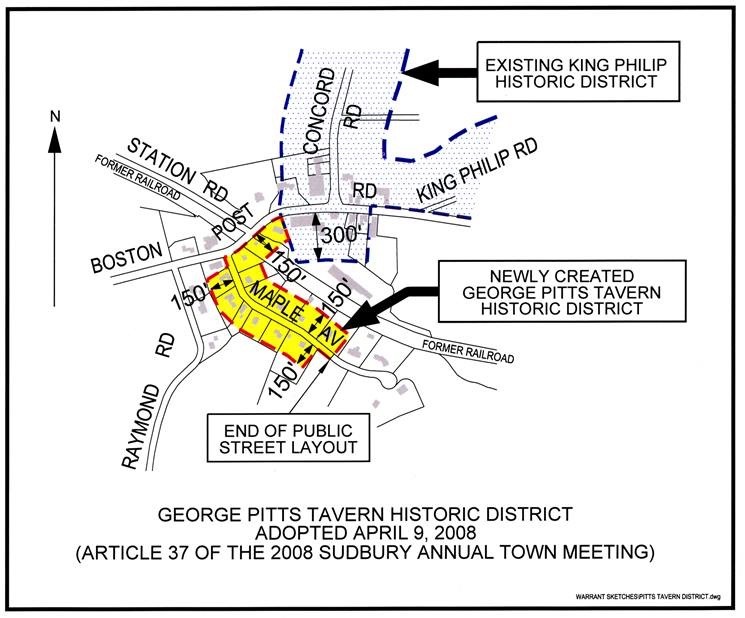 The project will cut through or along side three historic districts of the town including the King Philip Historic District, Wayside Inn Historic District, and the George Pitts Tavern Historic District. Are there solutions that do NOT involve the Sudbury-Hudson grid connection? The short answer is YES! An alternate solution was included in the ISO-NE report that involves upgrading the existing Hudson grid connection as an alternative. The initial costing of this solution was $60 million. The initial costing of the Sudbury-Hudson power line was $41 million. Since the Sudbury-Hudson line was significantly less expensive and provided a redundant path to Hudson, that option was selected. Where can I look at the Eversource Petition to the Energy Facilities Siting Board (EFSB)? What steps can Protect Sudbury take once the submission to the Siting Board takes place? Do we or the town get to vote on whether to accept the Eversource Proposal? The Energy Facilities Siting Board (EFSB) makes the final decision on which option will get built. Or they can reject the petition altogether. How will the Eversource project affect real estate values in Sudbury? How much it affects house values will depend on which option the EFSB chooses. For either of the options on the MBTA right of way, there will be an impact to homeowners. It depends if you are a direct abutter, in view of the towers (if it’s the overhead option), live in an impacted neighborhood, or live in an adjacent neighborhood. Given that the overhead option remains on the table after a year of requesting Eversource reject it, we have to consider that they have every intention of building it if the EFSB chooses it as the best option, given that it is the cheapest. Based upon extensive research and local data on property value impacts of overhead transmission lines, direct autters can expect: a 10-30% drop in home value. Similarly, properties that are in view of the towers can expect a 6% to 20% drop in home value. Higher-end homes in proximity to overhead transmission lines will experience the greatest declines in property value at the upper end of the estimated ranges. Abutting properties can expect significantly longer time on the market. And the buyer pool for homes affected by power lines would decrease by about 50% or more. Property values in neighborhoods impacted by the transmission lines or adjacent neighborhoods will decline. We estimate this will be between 1% and 5%, depending on how close your home is to the power lines. In terms of tax abatement, only direct abutters, not those simply in view of the towers, can expect a tax abatement (probably 15% in land value only). Non-abutters may experience drop in resale value, but don’t have the tax abatement. How can I help with the campaign against Eversource? Thanks for asking! You can help by fundraising, educating, and advocating! Fundraise: First and foremost you can donate to Protect Sudbury. If we can’t fund our legal fight, the fight is over. Donate online or, send a check to: Protect Sudbury, Inc., 79 Robert Best Road Sudbury, MA 01776. Advocate: Write and call our elected officials to let them know how you feel about this proposal. We have lists of State and Local officials as well as Eversource contacts: http://www.protectsudbury.org/letter-writing-campaign. You can also write a letter to the editor of the papers that cover our area. Where can I get flyers and handouts to give to friends and neighbors? What do Street Captains do? Street captains help spread the word to their neighborhoods about the Eversource proposal and encourage people to get involved. Street captains organize teams to go door to door with informative flyers (a great volunteer project for high school students for which they can receive community service hours). Street Captains are the direct contacts for Protect Sudbury working group members. Although totally optional, many street captains are also hosting neighborhood open houses, so that residents may have their questions answered directly by Protect Sudbury Board members. Please email us at streetcaptains@protectsudbury.org and we will send you helpful info to get you started! Our Street Captain Coordinators are Chris and Bill Densel and they’d love to hear from you. What are the open houses I’ve heard about? 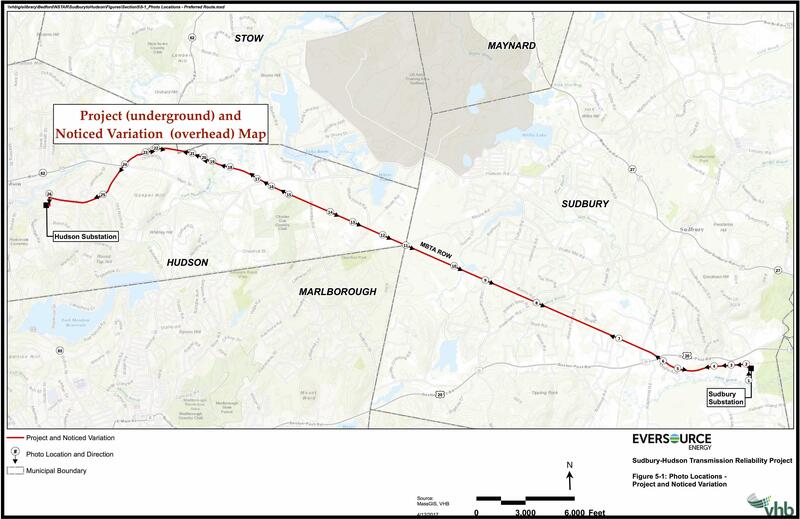 Street Captains invite neighbors to open houses to learn more about how the proposed Eversource transmission line project along the MBTA rail bed will affect each of us. A top local realtor is present at each open house to speak on the impact this project, if passed, will impact our real estate/property values. This is a great opportunity to ask any questions you may have about this important issue affecting all of us. If you are interested in learning more, please contact streetcaptains@protectsudbury.org to find out when one is being held in your neighborhood. We’ll keep a running list of orders until we hit 25 and then do a bulk order. If you want to do your own bulk order, you can contact Gemini Signs in Marlboro – 508 485 3343. Of course there’s nothing to stop you making your own signs. Knock yourself out! What other volunteer skills do you need? This is a grass roots effort. We’ve been at this for over a year now, so we’ve tried a lot of things and kicked around a lot of ideas. What we really need is the bandwidth to bring these ideas to life. So if you can help out, let us know! Our number one priority is always fundraising. Although it can be frustrating to keep repeating that we have to focus on the money, the bottom line is that if we can’t pay our lawyer, we can’t win against Eversouce. How do I contact my elected representatives? When you get a good response, don’t forget to thank them! How do I contact Eversource? What position have our local commissions, officials, and environmental groups taken on the Eversource proposal? It’s important to realize that although official support is an essential part of the fight to stop Eversource, it doesn’t de facto mean this project will not go forward. These commissions don’t get a final say or even a vote. How do I donate to Protect Sudbury’s legal fund? You can donate by check, Paypal or credit card. You can also set up a monthly recurring payment if you wish, using PayPal. Why does Protect Sudbury need its own lawyer if the town has one? Legal representation provides us a ‘place at the table’ and the ability to direct and lead all legal efforts in a manner that is consistent with the organization’s overall goals. Having our own legal counsel helps to guide and direct our efforts in the most effective way possible moving forward. Protect Sudbury is unique in that it alone can focus on this one issue, whereas the Town has additional legal battles to contend with as well as many constituencies to serve. Having dual legal representation for Protect Sudbury and the Town is in no way redundant. The Town has important legal status as an Intervenor before the Energy Facilities Siting Board (EFSB) and can exercise certain rights that are unique to that status to help achieve our goal. Likewise, an organization such as Protect Sudbury, has unique legal status before the ESFB, and can advocate and lobby for aspects of our cause that are not available to the Town. Every group appearing before the EFSB as an Intervenor must have legal representation. That’s why we have secured Burns & Levinson to represent our interests and why we are collecting donations to our legal fund (http://www.protectsudbury.org/donate/). How are the funds raised used in our legal fight? Our primary fundraising effort is to fund the legal battle. The vast majority of funds raised are used to pay for legal fees. 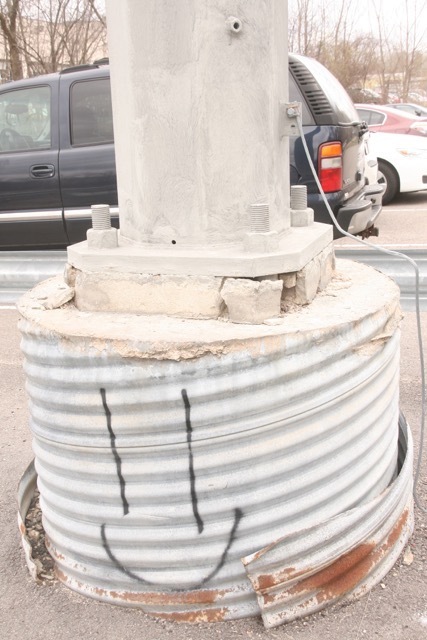 Cases like these rely very heavily upon professional experts in the areas of utility engineering and siting. This effort will also likely require environmental experts. Experts are a large expense in this legal battle and your money will be used to hire the top available experts. A small percentage of funds raised are used in administrative costs (printing and special projects) and things like insurance. How did Protect Sudbury choose Attorney Kanoff? Volunteers on the legal subgroup gathered input from the community and conducted their own research on firms with relevant experience and expertise. After a thorough search of firms with relevant experience and numerous interviews we solicited proposals from several different firms. Each proposal was examined and graded on 8 different criteria such as utility experience, firm reputation, and experience with groups such as ours. Richard Kanoff scored very high in each category. He is the chair of Burns & Levinson energy & facility practice group and has been in practice since 1974. Richard has extensive experience representing both utilities and community groups in the utility siting process and has appeared before both state and federal agencies responsible for approving siting plans. He is the lead attorney for community groups just like ours in Mass and NH in the battle with Kinder Morgan on their proposed gas pipeline. Recently, due to opposition, Kinder Morgan withdrew its gas pipeline proposal. Richard a former Assistant Attorney General in the Utilities Division in MA. Burns & Levinson is a large and well-respected law firm that enjoys a regional and national ranking by US News and World Report. The firm also has other departments that it can draw upon that may become useful during our fight such as real estate litigation and environmental. Herbicide treatment is part of Eversource’s ongoing plan to maintain the clear cut along the lines. Is herbicide spraying safe? The short answer is not in this context. Although the herbicides used by Eversource are approved for use by the state, there is good cause for concern. Regular spraying in environmentally sensitive areas is harmful to the plants and animals that inhabit those areas since they are subject to consistent higher levels of exposure. In addition, one of the approved herbicides for use in vegetation control is glyphosate, a substance deemed as a “probable carcinogen” by the IARC, the World Health Organization’s cancer assessment agency, and currently banned in several countries. Another approved herbicide used by Eversource, fosamine ammonium (Krenite), has had no human health risk assessment as it’s not approved for residential use, yet it’s used on rights of way that are cleared right up to abutter’s properties. Is Eversource building us a rail trail? No. Eversource’s proposal involves construction of a non-continuous service road which they claim can be used as a base for a rail trail. The proposal does NOT include construction of the trail, nor maintenance of the service road for other than Eversource purposes. Although in Eversource’s submission to the EFSB, the underground option included bridge repair, the overhead option does not. Protect Sudbury has no official position on the rail trail itself, but recommends that the town reject the current Eversource proposal through the MBTA right of way on economic, aesthetic, and environmental grounds whether or not Eversource claims their “service road” is a “base layer” for a rail trail. If Sudbury wants to be part of the Mass. Central Rail Trail that is planned to connect Boston to Northampton, that’s something for the town to decide, not a private utility. Most rail trails are 12-20 feet wide and would have considerably less aesthetic and environmental impact. Sudbury loses power a lot, why won’t this project help? Power outages tend to be caused by downed local distribution power lines, not transmission line issues. Massachusetts currently has a surplus of energy. Local power losses aren’t related to transmission capabilities. Sudbury's past power outages have occurred along the distribution lines from the substation to the consumers, not in the transmission lines delivering power to the substation. The intention of the new transmission line is to provide a redundant feed to Hudson so that power can be sourced through Sudbury and beyond to the western suburbs, currently served only through the Northboro Road substation. What’s the difference between transmission lines and distribution lines? Transmission lines are high capacity power lines that bring electricity from a generating station into local substations. Distribution lines carry power from local substations to homes and businesses. Eversource’s proposal is 115 KV transmission lines, which are much higher voltage than the lines you see strung on phone poles around town. This project is transmission lines which is why the poles are so tall. Can’t we all switch power companies to hurt Eversource’s bottom line? Only if you leave the grid completely! But you can go solar, which will lower your electricity bill and benefits Protect Sudbury too! When you go solar with Direct Energy Solar now through September 30, 2017, Protect Sudbury receives a $1,000 donation. Take ownership of your electricity bill and energy future. Sunshine is a clean, consistent, reliable source of power for your home. All Direct Energy Solar systems come with a custom-designed solar system, a choice of payment options that maximize your solar investment, a 20-year production guarantee, and a 20-year workmanship warranty. Help our planet by generating your own clean energy from the sun! If you can't go solar you can switch suppliers or wait until the town of Sudbury’s Aggregation Program comes online in fall 2017. Learn more about aggregation here: http://sudbury.wickedlocal.com/news/20170601/sudbury-electricity-aggregation-program-to-boost-renewables. Is there any realistic possibility that they will pull out of the Sudbury project altogether? We don’t think that it’s likely that they will pull the project prior to going before the Siting Board. The Siting Board might end up pushing this back to ISO New England by denying their petition. What are the projected costs of the Eversource route options? According to Eversource’s petition to the EFSB for the the conceptual level cost estimate (-25%/+50%) in 208 dollars. Note that since the cost estimates are (-25%/+50%), each number estimate should really be expressed as a range, in which case, there are considerable overlaps between the routes. Who Pays for Transmission Lines? According to Eversource FAQ,"...For projects deemed to be of regional benefit, such as the Sudbury to Hudson Transmission Reliability Project, the cost of the new transmission facilities are shared by all electric consumers in New England based on the level of energy consumed (“load share”)..." Whatever happens, overhead, underground, in Sudbury or somewhere else in New England, if a utility builds new transmission lines, it's us, the consumer who pays. If we succeed in fighting the overhead lines, what are the cost implications for us as consumers? We have not been able to determine definitively how localized cost is determined. The utility can propose any solution that they want, but it’s ultimately up to ISO New England and the Federal Energy Regulatory Commission - FERC. Most costs are either allocated to the entire state (as opposed to the New England Region) or to the particular utilities’ customers within that state. ISO makes an accounting determination and recommendation to FERC; FERC generally goes along with ISO determination. If contested, FERC can open an investigation. After an ISO solution study is issued, that could change through the stakeholder process. Communities have the ability to provide their input and help shape the solution – the EFSB looks broadly at projects to see what other methods could be reviewed or alternative routes there may be for a transmission line. EFSB looks at project alternatives. Communities could provide a competing non-transmission alternative proposal in their intervention.